Yes, The Taking of Pelham 1 2 3 is a remake of this movie. And while it may not be as “A.D.D.-friendly” as Tony Scott’s version, it’s still a really good movie that stands out as one of the more intense and entertaining heist movies from back in the ’70s. 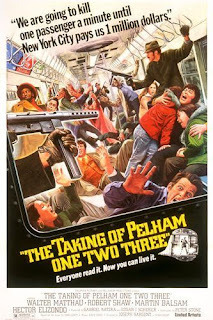 The Taking of Pelham One Two Three is about a transit cop who has one hour to negotiate a million dollar ransom with four guys who up and hijack a New York City subway car before they start killing passengers a minute at a time. Like I said, it’s an intense movie. But aside from being a good action movie with a great premise, the best part about this movie is actually the script. I was going into this expecting a cheesy, retro, “’70s disaster movie”-type thing, but I was pleasantly shocked to find that it had better writing in it than an overwhelming amount of action movies, or just movies in general, in recent memory. The movie doesn’t get over its head with in regards to what’s plausible and the plot moves along at a really solid pace without going overboard. It continuously keeps the audience in check, always reminding them that the clock is ticking and lives are on the line, but it doesn’t take itself too seriously, like it’s end of the freakin’ world and there is no time for jokes…EVER. The dialogue is really sharp and really funny and it makes all the characters seem legitimately real, which is rare in movies. At the same time, the tone can be a little too light at times when it shouldn’t be. I found it a little strange that I was more outwardly concerned for the lives of the innocent people onboard the train than they were themselves. The cast is also great. Walter Matthau plays the lead transit cop and Robert Shaw plays the lead train-jacker. As a general rule of thumb, anything that Walter Matthau is in is something you should watch. Why? Because Walter Matthau’s in it, and he’s great no matter what role he’s playing. And if you’re like me and only really know Robert Shaw as Quint from Jaws (for God’s sake, please see Jaws if you haven’t already), then that’s even more reason to see it. He was the man in this movie. A man’s man if you will. And as a bonus of sorts, if you like Reservoir Dogs, you’ll dig this movie even more; it’s got Tarantino written all over it. Not only are the four bad guys are all named by colors, but you can really see how their interactions and character types translate pretty seamlessly over to the main characters in Reservoir Dogs. The dialogue has a real Tarantino-esque feel to it and it’s really just easy to see that a lot of his inspiration for that movie came from this one. I’m sure I’ll get around to seeing 1 2 3 one of these days, even though I’m thinking it’s going to be another epic diaper rash by Tony Scott, but the point is, you should be watching One Two Three regardless.